2Adnan Menderes Üniversitesi Tıp Fakültesi Aile Hekimliği Anabilim Dalı, AYDIN Background and Aim: Spinal anesthesia has advantages when compared to general anesthesia but it has some disadvantages also such as bradycardia and hypotension. We aimed to evaluate hypotension during spinal anesthesia and associated factors in elderly. 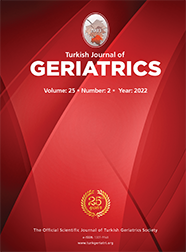 Materials and Methods: One hundred and nineteen elderly operated under spinal anesthesia in Adnan Menderes University hospital between May and December 2004 were evaluated retrospectively. Chronic conditions such as diabetes and hypertension, ASA (American Society of Anesthesiologists) classification, body-mass index, operation type (urology, orthopedics and general surgery) and sensory block level due to hypotension after spinal anesthesia were evaluated in all patients. Results: Sensory block level (OR=15.3, p=0.001) and presence of chronic disease (OR=16.47, p=0.0001) were influencing factors on hypotension during spinal anesthesia, but not age.